Parents are the lifeline of the Pack. Scouting requires parental involvement at all stages to ensure each scout has a safe and fun experience. Parents are encouraged to participate in all Pack and Den activities, including meetings. We are always in need of volunteers to assist the Pack Committee in both official and unofficial roles. 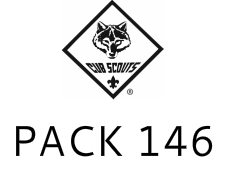 Please check with your Den Leader or any other leader at a Pack Meeting for volunteer opportunities. Below are some useful links that will assist you and your scout along the scouting trail.